It might not have that certain something that the phrase March Madness does, but we’re experiencing some pleasant November normality here in Zag nation. After Friday’s 92-69 victory over Utah Valley, the Zags are now a perfect 13-0 in season-openers at the McCarthey Athletic Center. For fans of the No. 13 ranked Bulldogs the night went about as well as possible. 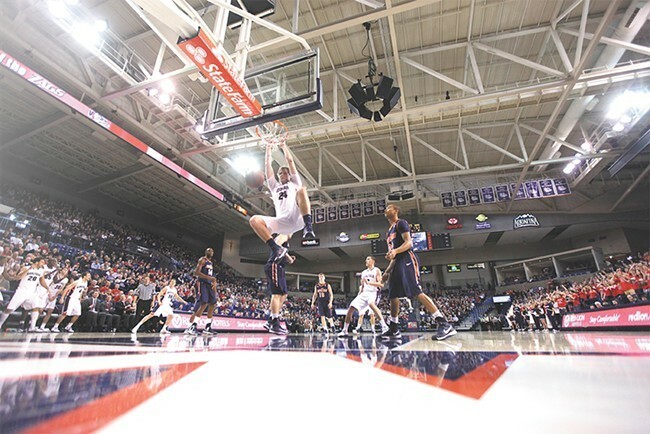 Newcomers like UW transfer Nigel Williams-Goss (14 points, eight rebounds, six assists) and Cal transfer Jordan Mathews (15 points, 4-7 from three) showed why they landed on preseason award watch lists. Yet for a team filled with fresh faces, it was the two veterans who led the way. Junior guard Silas Melson was the team’s leading scorer with 17 points. Przemek Karnowski (14 points, seven rebounds) looked no worse for the wear after last season’s back injury. Early in the second half, the senior center sent the crowd into a fury with a dunk on one end of the court, followed by a batted pass and a rebound on the other. It should be noted that coach Pope was formerly an assistant at Gonzaga’s run-and-gun conference rival BYU. So perhaps that’s why this was such an uptempo game. Gonzaga played 81 possessions against Utah Valley, three more than they did in any non-overtime game last season. Freshman Killian Tillie had an impressive debut, falling one point and one rebound shy of a double-double in just 20 minutes played. Fellow freshmen Zach Collins (9 points, four rebounds) and Rui Hachimura (four points) played less than Tillie, but both looked comfortable in their collegiate debuts. Any questions about how all these newcomers would mesh with the Bulldogs’ system — just three guys who played here last season saw meaningful minutes tonight — were largely answered with a resounding victory to open the season.